Last night, I found myself back in the book mood. 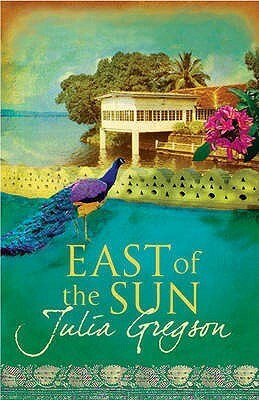 I decided to take another whack at East of the Sun by Julia Gregson. This time, I couldn’t blame not being in the book mood for my distaste of the book. East of the Sun is not for me. [ This is why I’m scared to do Advanced Copy Reviews…I just can’t put myself through certain books.] I did like the idea of having a good look at what the British Empire was like for English wives in India. It was an interesting concept, looking at “The Fishing Fleet,” those debutantes who had not successfully reeled in husbands during “the season” in London and so had to go to India, where the ratio of British men to women was 3:1. The book definitely had some good qualities. However, the characters and the plot line were too thin and broke before they had a chance to reel in this reader. The main characters are Rose, Tor, Viva, Guy, and Jack. Rose is heading to India because, being an English beauty, she met Jack on his leave in London during the season, and agreed to be his wife. She is traveling with Tor, her husband-less, lovelorn cousin, and Viva, their chaperone. Viva happens to be younger than she has claimed, and also has charge of Guy, an 18-year-old boy who has been kicked out of boarding school and sent home. He has some mysterious behavioral issues. I thought the character development got off to a good start, but then floundered after everyone boarded the ship to India. Everyone is embroiled in some personal mystery, that is slowly revealed through the book. It’s intriguing, and I can understand some readers really enjoying it. The soap opera feel of the plot on board the ship just got to me. People were throwing themselves at each other, lavish settings were described half way but not completely detailed, and a certain darkness surrounded everyone. It was as if something bad was lurking underneath the surface. So have you finished East of the Sun? What did you like and not like about it? I am now finally reading The Princess and the Goblin by George MacDonald and really enjoying it so far. Classics are so safe, you know? I’m headed to the beach soon so I’m trying to gather some good beach read titles. Let me know if you have some ideas to share!